Long story shortened... I have a 00 GMC Sierra, 4.3 v6 SE Stepside. I back probed the wrong plug wire on the BCM using the wrong method (test light rookie mistake, DMM only...got it, lol). The security light flashed, truck wouldn't start...yada yada. Fixed all that and on the road again. However, ever since that incident my OBD2 is not talking to anything I've hooked to it. Truck runs as always, like a champ. But I can no longer moniter things by way of the OBD2. Yes it has power. Scan tools scan every protocol but don't link. Like the PCM is mad at the port and won't talk lol. But seriousl, do I need it reprogrammed or is there an easier fix that you mechanical masters can offer my shadetree efforts. Thanx in advance. If the ground is good then it is either a bad connection on pin 2 back to the PCM or a Bad PCM itself, which I suspect is the problem. Note that the OBD2 port is fused. Does the cigarette lighter / accessory port work? (They're typically on the same circuit.) I had this issue on an Escalade, turned out to be a fuse. Shrug. Check your fuses. Look for the one labeled "accessory", "ACC", "CIG", etc. on the label on the fusebox lid. Break in the harness between the OBD2 connector and the ECU. One of the pins in the connector is pushed back into the housing, or bent out of shape, so far that your tool's OBD2 cable can't make contact. This is easy to do with a probe if you're not careful. Your probe will make easier contact than the diagnostic cable (or module or whatever) since you can wiggle it around. Just because the meter connects, doesn't mean that the cable is getting a good connection. Bad ECU. I have personally experienced a bad ECU that would run the car, but wouldn't talk to anything. I'd start with the fuse. If that doesn't get you anywhere, remove the two mounting screws for the OBD2 connector and physically examine the pin receivers (proper term eludes me at the moment) and make sure that they all look the same in terms of shape and distance from the front of the connector. If THAT doesn't identify the problem, probe the connection between the active port pins - there are usually only 5 or 6 (which ones varies per manufacturer) that are really connected to anything - and the ECU harness connector. 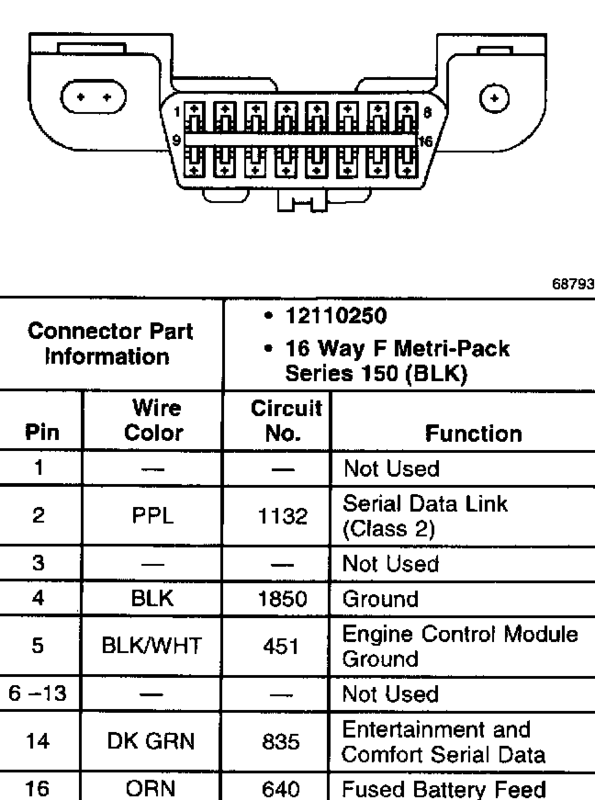 The service manual will tell you which OBD2 pins connect to which pins on the ECU, so you can check for continuity. Basically, disconnect the ECU, and check continuity between the used OBD2 pins and the corresponding pins on the ECU side of the harness. If you have good continuity on all of those pins, then you're looking at either bad or intermittent power to the ECU (bad ground, probably - it might still run the engine under these circumstances), or a bad unit. I once worked on a Mazda MPV with a similar problem. OBD II Scanner refuses to communicate with the vehicle! Not the answer you're looking for? Browse other questions tagged obd-ii or ask your own question.